Look at the resources you’ve identified. Do you have resources that look at your topic from different perspectives? If you came across resources that don’t support your thesis, will you include those and address the issues they raise? Do you have enough sources from different types of publications? You should not use resources that come from only one journal title, book, or only one author. If you don’t have enough, go back and do some more searching, maybe in a different database. Stop when you feel satisfied that you have identified enough key sources to adequately present your thesis. For the most part, you can trust that scholarly articles you find in library databases are reliable sources of information but what about information you find on websites? 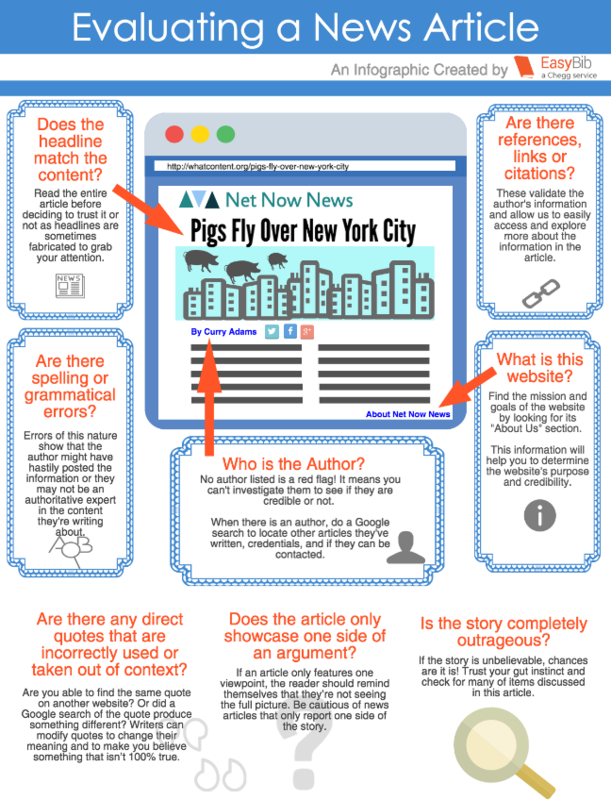 Use the tools below to evaluate sources that you aren't so sure of. Look for links on websites that say "About Us' to find out more about who is responsible for the site. Don't hesitate to Google the name of an author, website, or publisher to find out more about them. Avoid websites that end in “lo” ex: Newslo. These sites typically take pieces of accurate information and then packaging that information with other false or misleading “facts” (sometimes for the purposes of satire or comedy). This can include a real quote from a politician with fake information added in. Watch out if known/reputable news sites are not also reporting on the story. Sometimes lack of coverage is the result of media bias and other factors, but there should typically be more than one source reporting on a topic or event. What is the publisher’s interest (if any) in this information? Are there advertisements on the website? Is the creator/author trying to sell you something? from Libraries and Transliteracies, Creative Commons Attribution-NonCommercial-NoDerivs 3.0 Unported License.